You'll receive 100 Rounds of mixed lot, steel and/or aluminum cased 45 ACP Ammo, loose packed in a clear plastic bag. 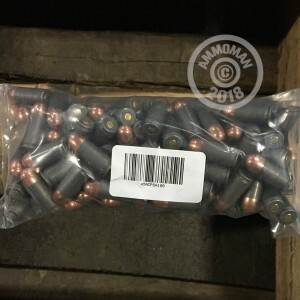 All lots may contain a unique mix of range and defense ammo, in a number of different bullet weights, from a variety of manufacturers. 200 of 500 - so far - Good to Go! Fired 200 of 500 rounds purchased to check out a new AR-45 build. They all went bang with zero problems. Would recommend for non critical use with no hesitation. The vast majority of it is Tula, with either copper or zinc plated bullets. There were a handful of aluminum-case Blazer in there as well. Price was a little better than the best shipped price I could find for boxed Tula... and, other than not having a box, there is no disadvantage to using this stuff. Would not hesitate to buy it again.